A couple of weeks ago I and my 3 year old went for a weekend brunch at Monsieur Benjamin. Chicken crocuette, with fried egg, gribiche sauce, french beans and frisees. I don’t remember much about the chicken while trying to feed the little one, but I did remember that the sauce was very well made, with a very bright taste from the combination of mustard and pickled vegetables, but not so bright that it became one-dimensional. The French beans were also very fresh and cooked just right. I don’t know where they sourced their beans but its comparable in quality to the verts from Borba Farm from farmers markets, which is top notch. Again the sauce was the star and, along with the runny egg, brought all the components of the dish together. the duck confit was good as well. I am spoiled by Dittmer’s stuff and I was stuffed by that point so I thought its fine. Their bread is made by Della Frattoria and its yummy. the pickled radish was also delicious. Their butter is made by a place in the Midwest, name forgotten. The place during brunch was child friendly. A few tables with small children. They offered crayon (though I declined). One thing to note is that they offer Shigoku and Kusshi oysters, which I am a big fan of. Although I did not order at that time, since I wanted to try the French dishes. The online reservation system suggested they didn’t have table until 1:30pm although when I called in the morning they easily slotted us into 12:30pm. It was about half full on a Sunday. Overall it is a welcome addition to have a French option during lunch. Though it is a tad pricey for a supposedly bistro lunch, though the environment is fancier than a bistro. Now let’s see when Petit Crenn, which is a couple of blocks away, will start serving lunch. on the dinner menu, the quail and pork rib are well executed although quite rich. i found their beef short rib to be stringy and roast chicken to be on the dry side. 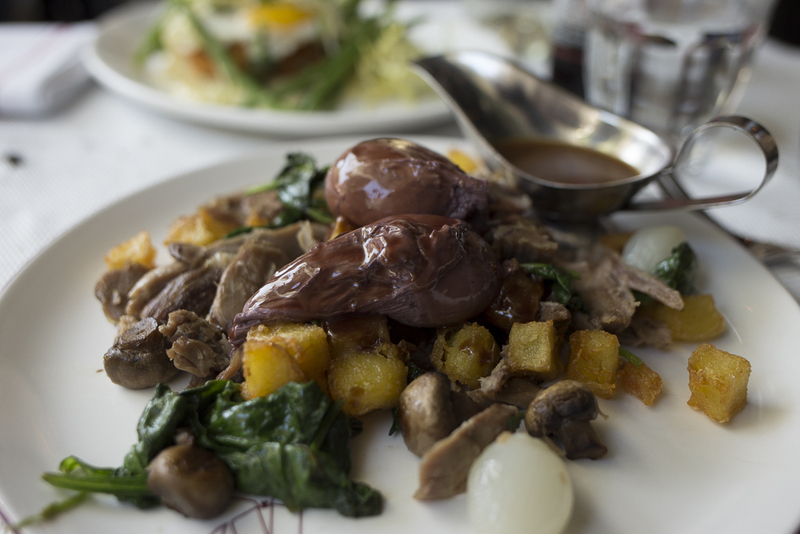 duck confit could be crisper and juicier. steak frites was quite expensive, would have preferred a cheaper and juicier hanger steak (or for less than half the price, the ribeye steak cubes at Garden restaurant in SF Chinatown, or brisket at R&G lounge). your kid will love the marzipan cherry ice cream.